What a fun way to serve spaghetti! It's got all the fixin's...cheese, beef and Italian sauce, baked together in a casserole. It's also a great way to make use of leftover spaghetti. Heat the oven to 400 degrees F. While the oven is heating, cook the spaghetti according to the package directions. While the spaghetti is cooking, season the beef as desired. Cook the beef in a 10-inch skillet over medium-high heat until well browned, stirring often to separate meat. Pour off any fat. Stir in the sauce and cook until the mixture is hot. Drain the spaghetti in a colander and return to the saucepan. Add the ricotta cheese, half the Parmesan cheese and half the mozzarella and the beef mixture and toss to coat. 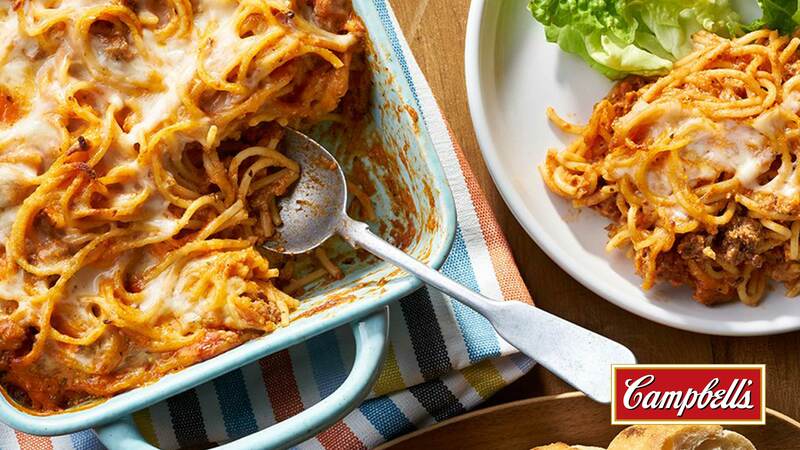 Pour the spaghetti mixture into a 13x9x2-inch baking dish. Top with the remaining Parmesan and mozzarella cheeses. Cover the baking dish. Bake for 30 minutes. Uncover the baking dish. Bake for 5 minutes or until the cheese is lightly browned. Let stand for 10 minutes before serving.